I'm back! 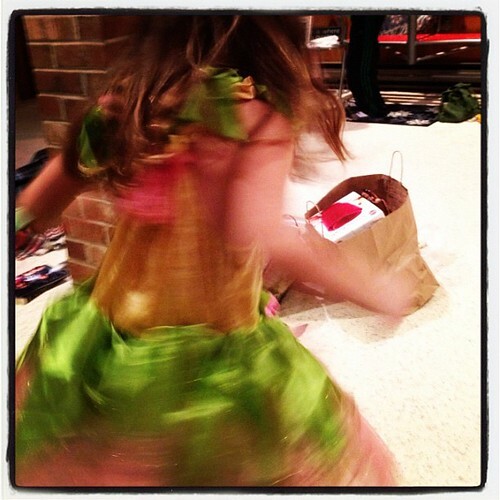 I had a beautiful holiday full of twirling princesses, a white Christmas, a little skiing, and lots of love in both New Hampshire and Chicago. I hope you had a great holiday season as well! Now that I'm back, it's back to the kitchen! This week I decided to try out a recipe that you might have seen before. Apparently, it's made commonly enough that when I brought in leftovers for lunch my coworker knew within minutes which recipe I'd made. But I made a couple of changes to make it my own, so hopefully it will still be a bit fresh for you! I still had lots of fish stock in my freezer from October, so I decided I'd add a little flavor to my pasta by boiling it in fish stock instead of just water. I'm not sure it made a whole lot of difference, but gave a nice undertone to the dish. One of my New Years resolutions will be to experiment with making new types of stock this year - I think that making my own chicken/beef/vegetable/lamb broths will be a lot more versatile than the fish broth, since I can't get the best seafood in DC. Does anyone have any ideas for what to do with my last 2 quarts? We really enjoyed this dish overall! I can't say it was my favorite dish of all time - it doesn't quite have our usual high impact flavor profile - but it was easy to throw together, tasty, and healthy. 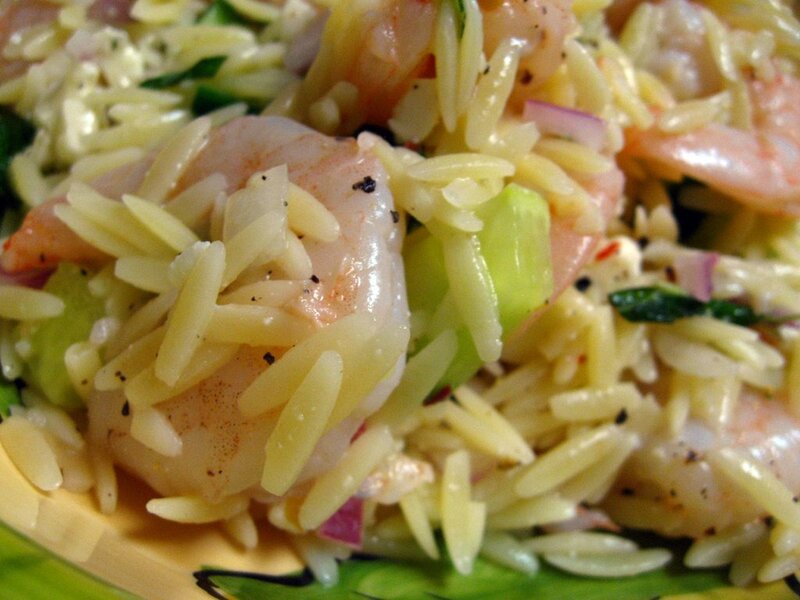 It was lemony, fresh, with some light protein from the shrimp (which were cooked to perfection after ~5 minutes), and I adore eating orzo. It'd be a great dish to bring to a potluck or on a picnic. It's also a pretty ideal dish to throw together when you need to eat a quick dinner so you can snuggle into bed to watch your team win the Sugar Bowl. And on that note, GO BLUE! 2. Fill a large pot with fish stock or water (fish stock just adds extra flavor! If using water, add 1 tablespoon of salt and a splash of oil), and bring to a boil. 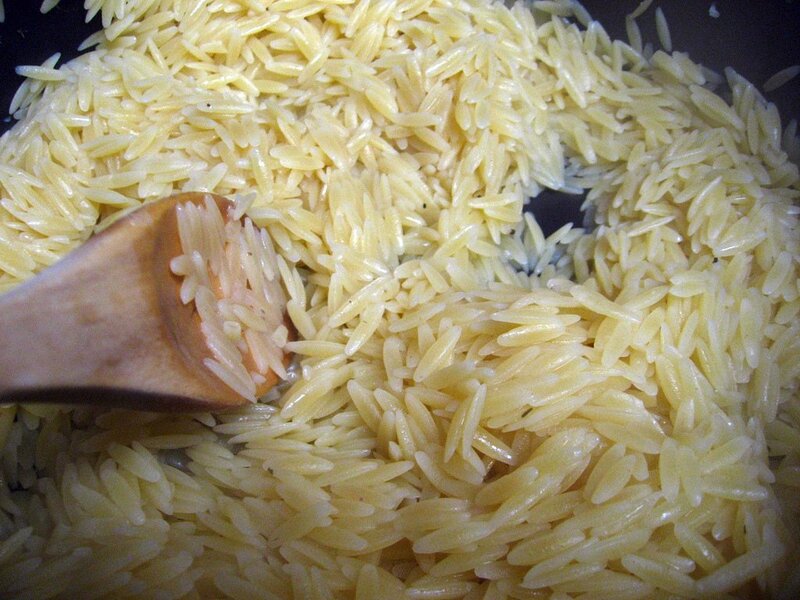 Add the orzo and cook until al dente (follow your package instructions). Drain and pour into a large bowl. Whisk together the lemon juice, 1/2 cup olive oil, 2 teaspoons salt and 1 teaspoon of pepper. Pour over the hot pasta and stir well. 3. 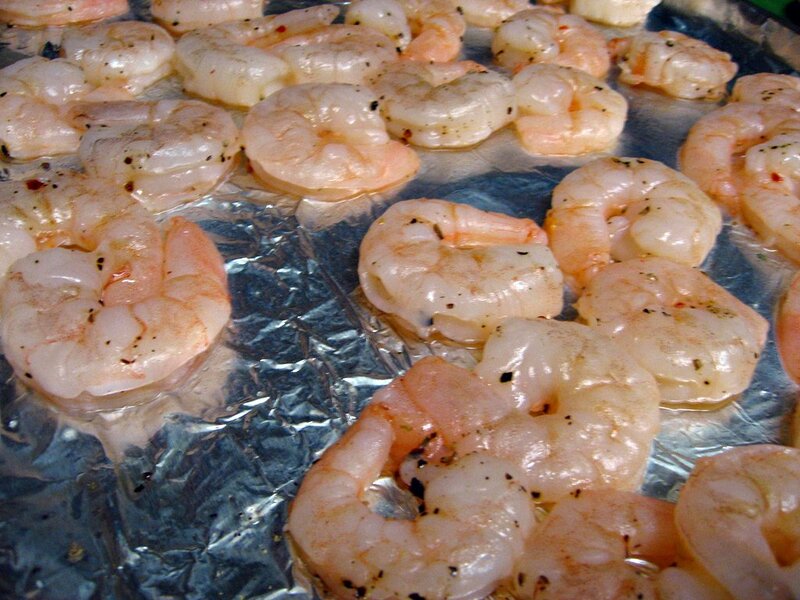 Meanwhile, place the shrimp on a sheet pan, drizzle with olive oil, and sprinkle with salt and pepper. Toss to combine and spread out in a single layer. Roast for 5 to 6 minutes, until the shrimp are cooked through. Don't overcook! 4. 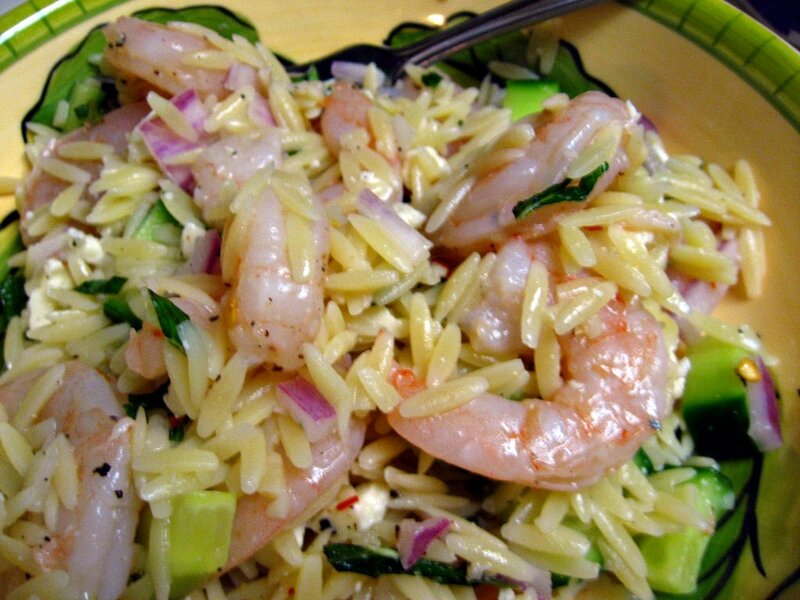 Add the shrimp to the orzo and then add the mint, cucumber, onion, 2 teaspoons salt, and 1 teaspoon pepper. Toss well. 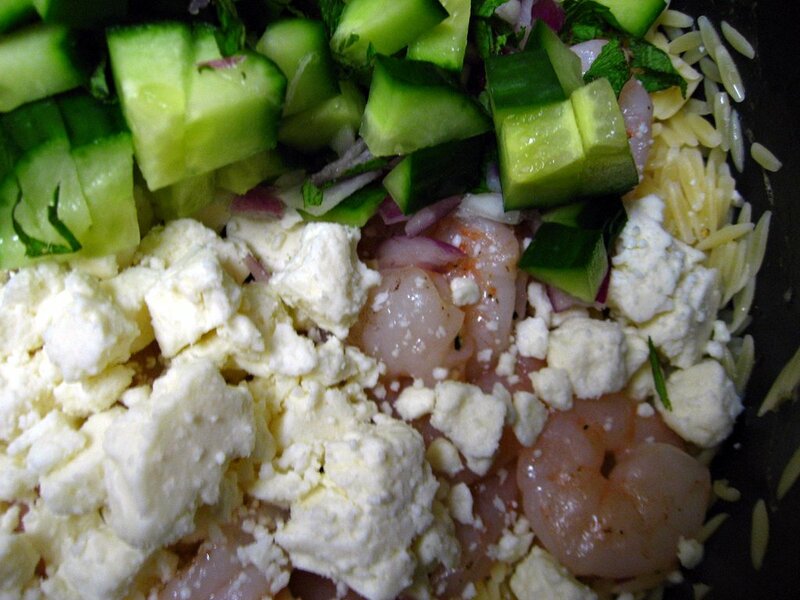 Add the feta and stir carefully. Unless you're totally impatient like me, set aside at room temperature for 1 hour to allow the flavors to blend, or refrigerate overnight. If refrigerated, taste again for seasonings and bring back to room temperature before serving. This looks delicious! I love orzo. I mean, it's so deceiving: it looks like rice, but it's actually pasta. One time, I served it to my brothers and they thought it was rice up until they took a bite. They were so confused! :) Orzo is a lot of fun! It's my favorite for any sort of pasta served cold/room temp. I'm a Tasty Kitchen Member!